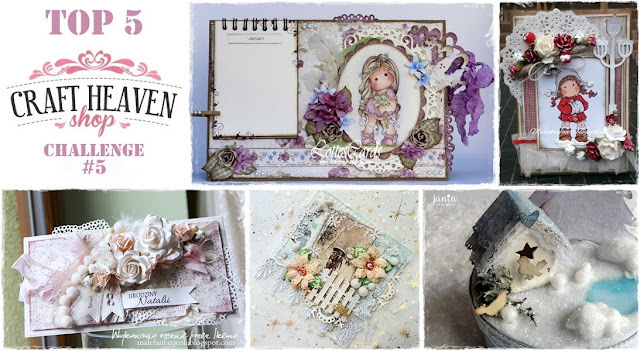 One more thing for today..
Yeah.. We didn't forget about the daily post..
All the papers Barbara chose are from the new Maja Design Home From The Holidays Collection..
She used the Happy New Year, Snowy Days and To Spend Time sheets.. The majority of the papers from this collection are in marvelous blue tones, but you can also find a variety of red and brown papers.. Perfect for the season and all your Christmas makes..
You can find the complete collection at a great price HERE.. The tag is not attached.. If you remove it you will find the gorgeous Merry Christmas sentiment under it.. 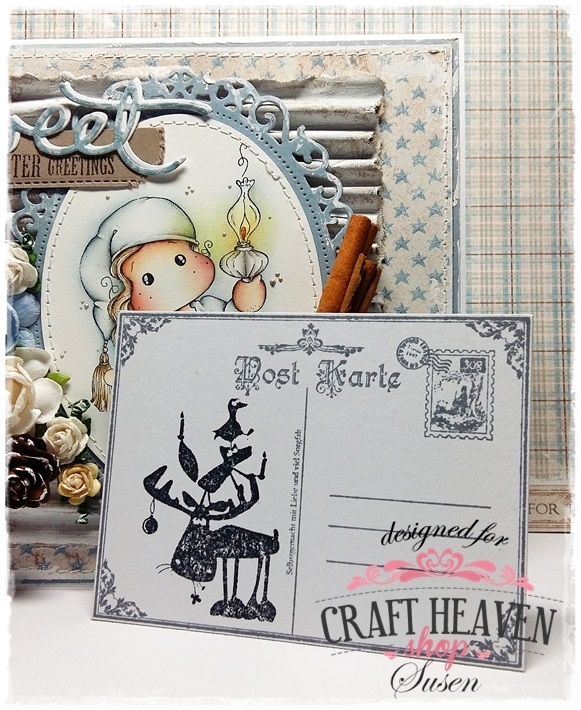 This stamp is called Lace Hood Tilda and it's one of the prettiest stamps from the Lovely Christmas Collection from Magnolia..
Barbara coloured her with Distress Inks..
She used some pretty Baby Blue Vintage Seam Binding and the Mini Bells on the tag..
And one of the dies from the Rounded Frames and Tags to cut out the image.. There are the White Decorative Foam Bouquets and some Cosmos Daisies..
..the stunning White Frosted Pomegranates and a doily to finish the whole look.. 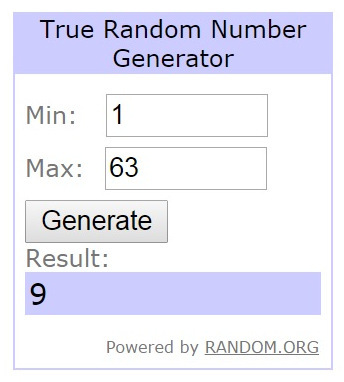 The interior is decorated too..
As I said in the previous post..
See ya all tomorrow when a new Monthly Challenge begins..
We are announcing the winners from our November Challenge.. 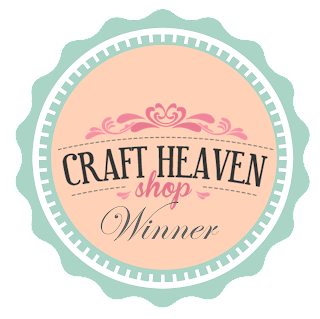 Thank you all so much for sharing your amazing creations with us!!! Here's your Top 5 badge.. The winner of the gift certificate chosen by Random.org is..
That's you Jay's Crafty Corner!!! 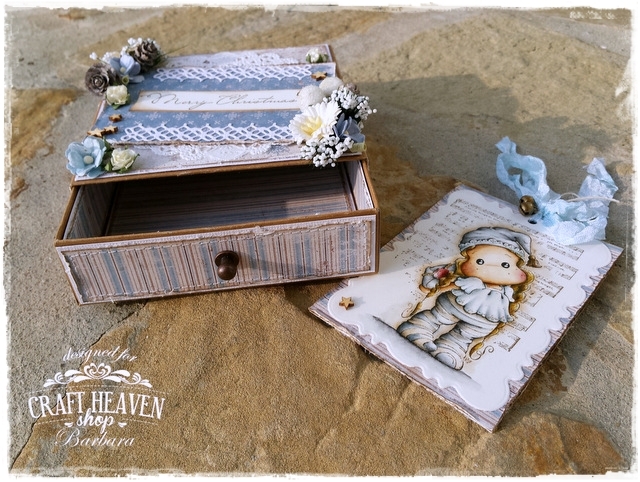 Hope to see some more of your stunning creations in our next challenge starting December 1st..
Another fun and easy theme is waiting for you..
Time to show you all a new gorgeous creation Izabela made for the Craft Heaven Shop Inspirational blog..
You all already know the theme this week is It's Cold Outside..
And this is what she made..
An altered box with a beautifully decorated lid.. 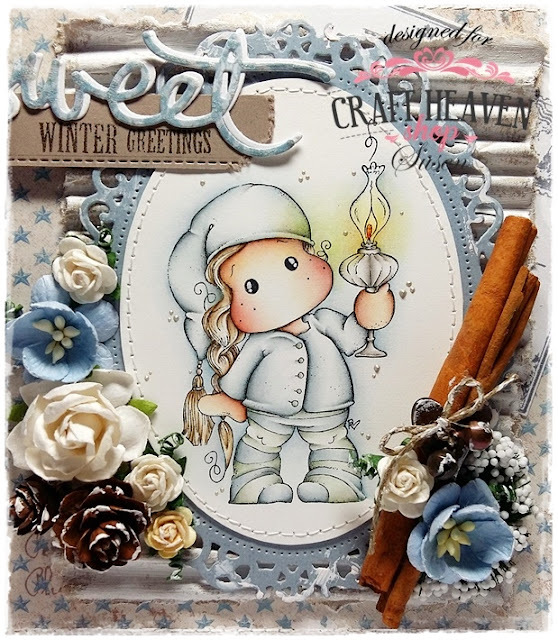 There is no better match for this theme than It's Cold Outside Tilda..
Just one of the beautiful Magnolia stamps you can find in our store..
And there is the new Maja Design collection too.. 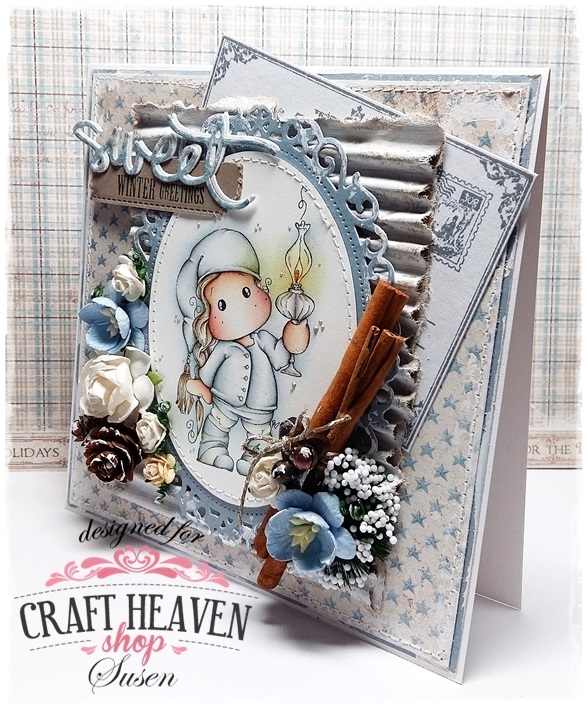 The papers you've been waiting for to make all your Christmas projects.. There is a special pack in the store so now you can get them all at an awesome price.. But there are so many other things you can get here..
Take a look at this stunning Diamont Pendant for example..
And then there are all those gorgeous high quality flowers.. The Open Roses, Wild Roses, Cherry Blossoms, Sweetheart Blossoms and more.. The Decorative Foam Bouquets can be now found in five different colours.. This is how Izabela's decorated gift box looks from behind..
She used once again her beloved Rose Leaf die from Magnolia, lots of glitter, Gesso and Glossy Accents all over the place..
Let's take a closer look at the flowers and berries..
And there is also some White Vintage Seam Binding and the super cute Mini Bells that are just perfect for all your Christmas projects..
You can even use them on your gift packagings.. They make such a wonderful sound if you shake them a bit..
We really hope you enjoyed our creation for today..
You can find the list with the links to all the products used for this projects at the end of this post.. Tons of great new products are waiting for you in the store..
And we offer Worldwide shipping at a very reasonable price..
Get yourself some Christmas presents now.. 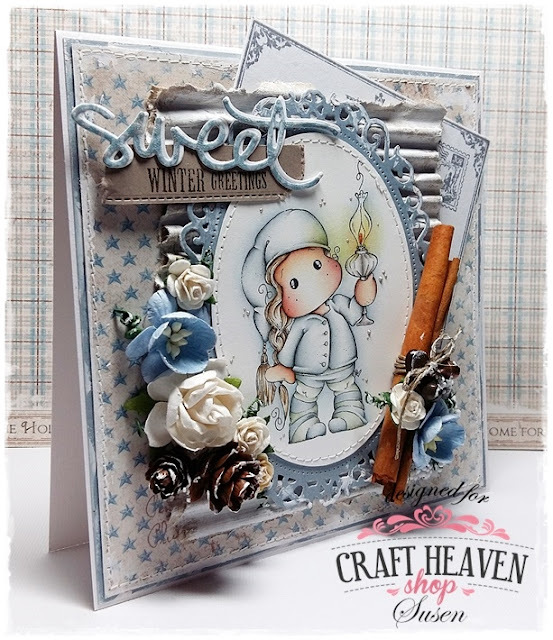 It's Susen who made this stunning card for this week's It's Cold Outside theme..
She used one of the newest papers from Maja Design.. The Friends sheet from the Home For The Holidays collection..
We all love the blue tones, but there are many pretty papers in reds and browns too..
You can see another one of the awesome new designs in the background.. The Pion Design Palette is always a good choice and the Pion Blue IV is a perfect match for these Maja papers too..
Susen used Tilda With Christmas Lamp from the latest Magnolia collection.. I'm always blown away by her amazing colouring.. 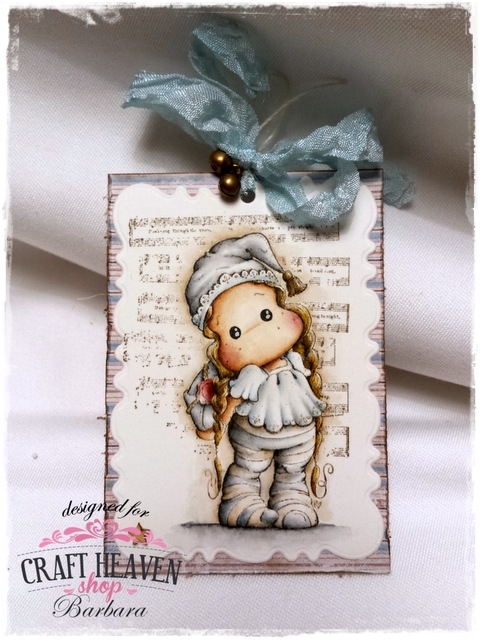 This babe is coloured with Distress Inks.. If you wanna complete your Distress Ink collection you can find the 2015 colours in the NEW section in the shop..
Can you see the fantastic effect the Crackle Paint gives on the sweet sentiment? A cinnamon stick is such an awesome element for all your Christmas projects..
And Susen topped it with a Wooden Heart Button and some super cute Mini Bells..
All these stunning flowers are high quality mulberry paper flowers that we carry.. But there are also the Decorative Foam Bouquets..
Two new colours have been added yesterday..
And finally the Post Card that was tucked under there is revealed..
Be sure to come back tomorrow because we have a fantastic project from our DT Izabela to share with you..